Designed for small huddle rooms and communal workspaces, Samsung and HARMAN’s Huddle Standard solution accommodates fundamental collaborative needs at a modest price point. 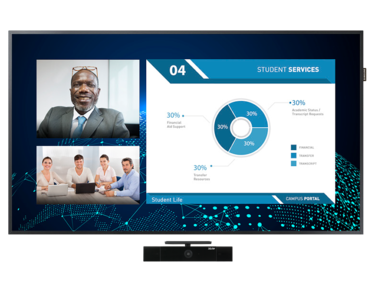 Facilitators and participants can leverage Samsung’s professional grade DC Series display to deliver laptop-based business content at high picture quality and clarity. The DCJ Series displays work in conjunction with HARMAN’s AMX Sereno video conferencing camera and users’ laptops to gather live and virtual participants through an ultra-wide 120-degree field of view. With the AMX Sereno’s built-in shutter and electronic microphone disconnect, the Huddle Standard solution also fortifies meetings with an added layer of security.